Tom Yam, Thailand’s famous hot and sour soup has got to be one of my all-time favourite Thai dishes. 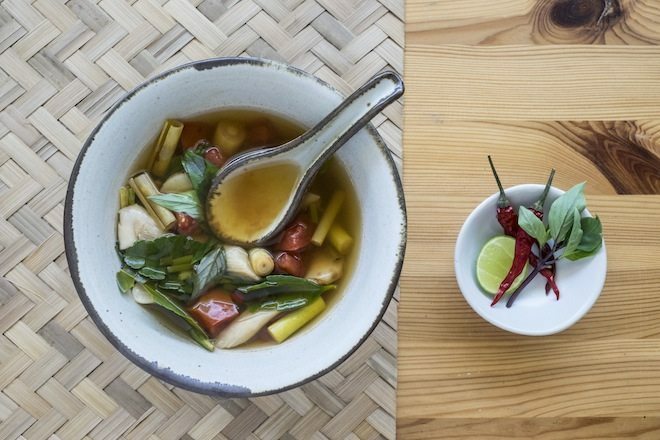 All the elements of Thai cuisine gather together beautifully in this sweet, salty, hot, sour concoction bursting with flavour, aroma and texture. 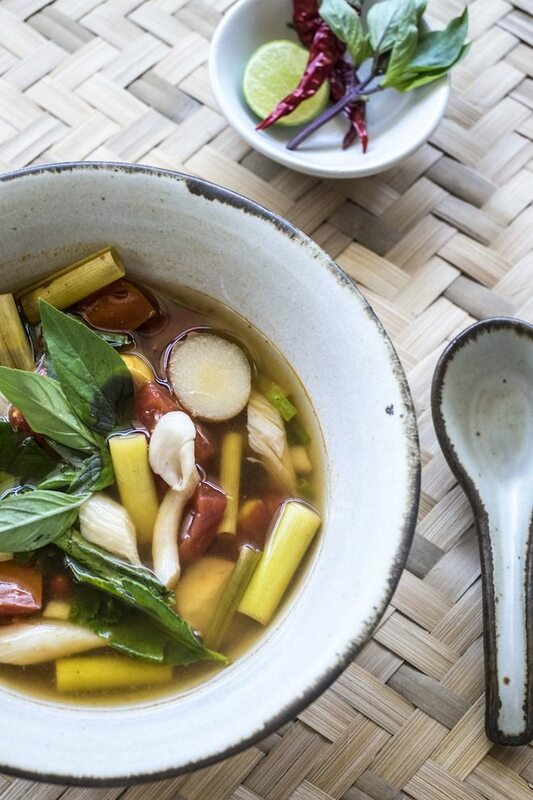 There are many versions of the iconic Tom Yam soup, but I will start with this vegetarian basic with mushrooms, Tom Yam Het. In terms of the mushrooms, you can use any kind but the most commonly used ones here tend to be straw mushrooms, and oyster mushrooms (my personal favourite). Just a note on water, given that in a sense it is one of the main ingredients of the soup, using filtered water is preferable. In Thailand, we cannot drink water direct from the tap so I often boil water first when cooking broths and soups or I use filtered water. I won’t go into the details and nasties, but some of the traces found in tap water can be quite scary. More information here. You can serve Tom Yam with Mushrooms on its own, or accompanied with rice. Enjoy this beautiful, comfort dish. Add the water, lemongrass, galangal, tomatoes and mushrooms into a saucepan and heat until boiling. Add the tamarind paste and chili. Now add the fish sauce and sugar and stir together. Add the mushrooms into the soup, along with the spring onions, Thai parsley, coriander and kaffir lime leaves. Stir well. Squeeze a quarter of the lime juice and taste the broth. Make any adjustments here (more chili, sugar, lime or fish sauce). Garnish with coriander or Thai basil and feel the flavour! Notes: The mushrooms can be substituted for chicken, seafood, tofu or pork. Shallots are also traditionally used in Tom Yam but I have omitted them here, feel free to add them in. You can also substitute the fish sauce for soy sauce. This post was made possible by Clean and Clear Water; water filter and purification specialists who ship their water filters and coolers Australia wide.